EZ Debt Crisis Deal: Good Enough… For Now. As Huck always says, “Good things come to those who wait.” We’ve waited for weeks until policymakers finally revealed their grand master plan to address Europe’s sovereign crisis. But is their plan good enough? Simply looking at how markets reacted to the news, it’s tempting to say that it is. 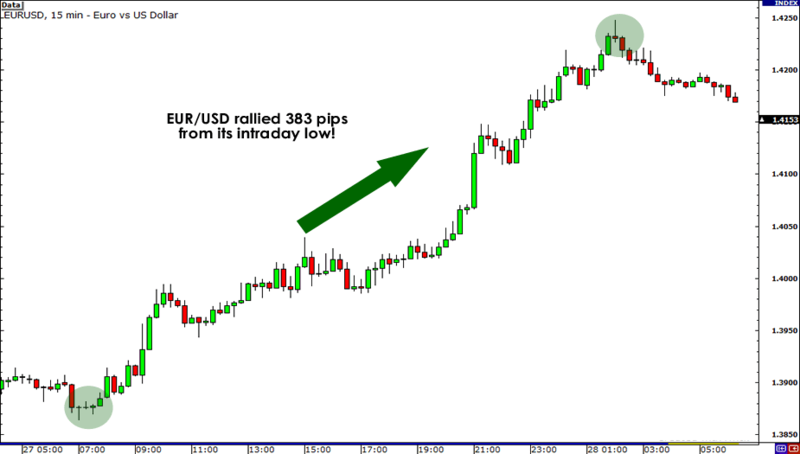 EUR/USD skyrocketed up the charts, rallying from an intraday low of 1.3865 to peak at 1.4248, when German Chancellor Angela Merkel and French President Nicolas Sarkozy unveiled their plan. In case you don’t remember, the pair hasn’t traded beyond the 1.4200 psychological handle since September. But being a man who has had his fair share of heartaches and disappointments in the markets, I want to examine the much-anticipated EZ proposals before I decide to join the euro bulls’ bandwagon. From what I’ve heard around the grapevine, it seems like there were three measures cited. Let’s take a look at them, shall we? The first one is to boost the EFSF. The fund, established to provide financial assistance to troubled EZ countries, will be expanded by around three to five times its initial size of 440 billion EUR. Where will they get all that money to pump into the EFSF? According to some market junkies, European officials are looking at emerging economies with puppy-dog eyes to shoulder part of the amount. The rumor is that EFSF Chief Klaus Regling went to Beijing in order to convince China to invest in the bailout fund. But whether or not he’ll be able to strike a deal with Chinese officials doesn’t really matter. In this old man’s opinion, more debt doesn’t sound like a solution to solving the debt crisis. Then again, that’s just me. Merkel and Sarkozy also proudly presented their proposal to recapitalize banks. Basically, policymakers are requiring banks to increase the core capital ratio of their Tier 1 capital (used to gauge how healthy a bank is) to 9% by June 2012. Officials say that by doing so, banks will have enough buffer to protect them in the event of a Greek restructuring. A few analysts did the math and said that banks across the region would need to raise a total of 100 to 110 billion EUR. However, the problem here is that banks could shrink their loan books and limit their lending in order to meet the requirement. If this happens, spending could slow down and the region’s already-sluggish growth could weaken even further. Heck, naysayers even say that it could spur the euro into a recession! Yikes! The deal is estimated to bring down Greece’s debt-to-GDP ratio from its current level of 140% to 120% by 2020. If you think that that ratio is still pretty high, you’re right. A lot of economic gurus think that the estimated level would still be unsustainable and predict that the Greek debt saga is far from being over. Don’t get me wrong, I think EU policymakers have to be commended for their efforts in solving the sovereign crisis. However, we have to be wary that there are still a lot of crucial details missing. Sure, this fact might have escaped the market’s attention for now because investors were just too dang happy that a plan has finally been presented. But in the next step of the process, which is the application of these proposals, I don’t think it would be so easy for markets to ignore the missing details. Do you think the EZ debt crisis deal will keep EUR/USD trading above 1.4100 in the coming week?